My mom and sister will be running a half marathon this weekend. Whether it be your first mile or your last, whether you're racing or training or just running for fun, don't put so much emphasis on how many miles you've gone or how many you've still gotta go. Just go. Run...and run with heart. Trust your body, trust in your training. It's one foot in front of the other from the start to the finish of each and every mile. So make every step you take, make every mile you complete...just make it count. 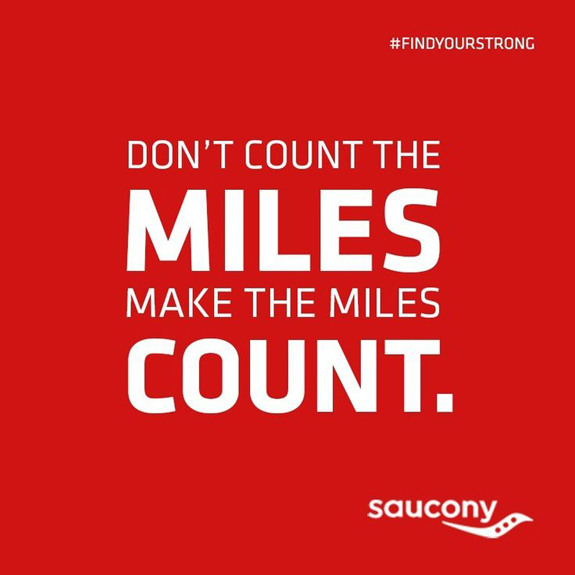 That's where you find your strength So, go... #findyourstrong. Got good pinspiration? Follow me, and use #pinspirationthursday on Pinterest and Twitter so I can follow you. Question: Are you running this weekend? In a race? Are you training? Tell me.